The Customize Windows > Computer and Internet > Internet > What is Asynchronous Transfer Mode (ATM)? Asynchronous Transfer Mode (ATM) is a communication protocol, which is intended for the transmission of voice and video data. The Layer 2 packets are called cells or slots and have a fixed length. This is the Asynchronous Transfer Mode (ATM) we talked about in our article on Internet Exchange Point. In short, Asynchronous Transfer Mode s developed to meet the high demand for transmission capacity for services and applications. The Asynchronous Transfer Mode was the bet of the traditional telecom industry for broadband communications. It was raised as a tool to build broadband networks (ISDN based on packet switching rather than traditional circuit switching). The deployment of ATM technology has not been as expected by its promoters; ATM is not clear and most appropriate option for current and future networks. ATM has encountered competition from technologies from IT industry, with projects such as VoIP seems to offer the best prospects. Today, ATM is widely used wherever it needs to support at moderate speeds, as in the case of ADSL, although the trend is to replace this technology for other as Ethernet, which is based on data frames. ATM is a core protocol used over the SONET/SDH backbone of the public switched telephone network (PSTN) and Integrated Services Digital Network (ISDN), but its use is declining in favor of all IP. Physical layer : Related to the physical transmission medium, adapted flows, protect header delimits cells and it adapts to the environment. ATM layer : Performs multiplexing and switching cells. AAL Layer (ATM Adaptation Layer) : Related to informational flows, flow facilitating the management, connection modes and if necessary, timing reference. 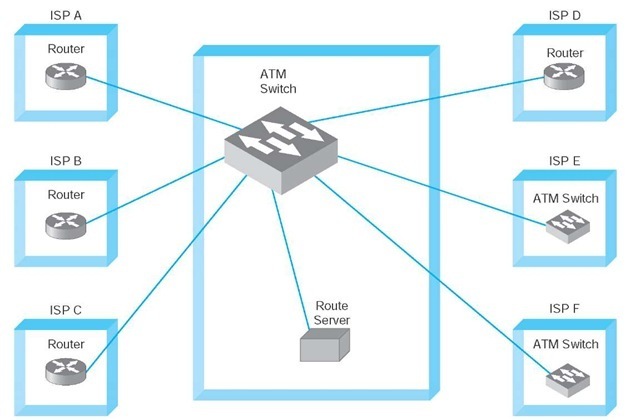 ATM provides a connection-oriented service by virtual paths (VP – Virtual Path) and the channels or virtual circuits (VC Virtual Channel). The paths and the virtual channels have the same meaning as virtual channel connections (VCC Virtual Channel Connection) after X.25, indicating the way forwarding to fixed cell. At the time of establishing communication with a desired quality of service and a destination, searching for the virtual path will follow all the cells. This path does not change for all communication, so if one node goes down communication is lost. When connecting the resources are reserved to guarantee throughout the session for maintaing quality of service to the user. When a cell arrives at a router, it will change the header according to the table that owns and sends it to the next with a VPI and / or a new VCI. This Article Has Been Shared 675 Times! Articles Related to What is Asynchronous Transfer Mode (ATM)? Internet of Things Does Not Mean Wearable Stuffs – One Company Might Want to Sell a Glass another a Watch, But Technology is About Science. Title: What is Asynchronous Transfer Mode (ATM)? Cite this article as: Abhishek Ghosh, "What is Asynchronous Transfer Mode (ATM)?," in The Customize Windows, April 21, 2014, April 23, 2019, https://thecustomizewindows.com/2014/04/asynchronous-transfer-mode-atm/.